It's been almost two weeks since i'm back home from the tour but i'm only starting to get back to normal life. When you are on the road non-stop even for a short amount of time, it takes time to get used to normal life again where you don't need to move all the time and you don't meet new people every day. I got the pics from the tour developed yesterday, i'll share them soon once i get time to scan them. 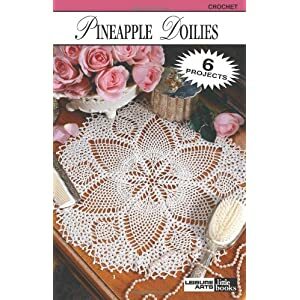 Unfortunately, i don't have any photos of the doily i've made using the pattern from the "Pineapple doilies" book, because i gave the doily to my mom. It was the doily from the cover. The instructions in this book were really clear and the doily turned out really pretty. From the "Lacy Crochet" book i especially enjoyed making round coasters. First i've made them exactly following the instructions. When i've used all the colors that i had with me and got a bit bored of the same pattern, i've tried a different edging. I've also tried a large square doily from the same book. I did my own edging and more rows than the pattern suggested. This large round doily was actually the first one i've made from the book before we left on tour. I am really happy that i got this book (the full title is "Kyuuto! Japanese Crafts! Lacy Crochet"). I really like the way it's designed, all the examples on the photographs are made with really pretty pastel yarn, really similar colors with the ones i have and i really like them. There are both templates and text instructions with photos for each project. There are also instructions for basic stitches, so the book could be good for beginners as well. It was my first time working with crochet templates, and i really liked it, because i often get lost in text patterns when there are lots of rows involved. There are instructions with photos for each sign in the templates, so i've learnt to use them quite fast.